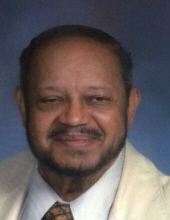 Vernon Slaughter, son of the late Orville S. Slaughter and Alice Slaughter, was born in Denver, CO., on May 13, 1933 and departed this life peacefully, January 13, 2019. Vernon Slaughter, too many known as "Dr. Sly", attended Denver Public Schools, graduating from East High School. He furthered his education by graduating from the University of Denver. While attending college, he pledged Kappa Alpha Si in 1953, Denver Chapter Beta Pheta. Vernon became an educator with Denver Public Schools, teaching at Manuel and Kennedy High Schools, from where he retired from his love of teaching. Vernon was a fixture in the community for many years, working the DPS. Summer School Recreational programs, and he was also active in the neighborhood Cub/Boy Scouts of America organization. One of Vernon's favorite pastimes was getting in his truck and driving throughout the Northeast Denver neighborhood, visiting with family and friends. He also received great pleasure playing his organ, laughing and watching reruns of Lawrence Welk. Vernon leaves behind two sons, Steven (Pamela) Slaughter of Atlanta, GA., and Timothy (Cheryl) Slaughter of Denver, CO. Three grandchildren: Tarina Slaughter, Desiree (Justin) Perea, and Shannon (Michael) Funk; and eight great-grandchildren, one great-great-grandchild, three nephews, two nieces, and a host of friends. To send flowers or a remembrance gift to the family of Vernon Slaughter, please visit our Tribute Store. "Email Address" would like to share the life celebration of Vernon Slaughter. Click on the "link" to go to share a favorite memory or leave a condolence message for the family.